Just days before it was set to review a case in which the state has been accused of executing an innocent man, Gov. 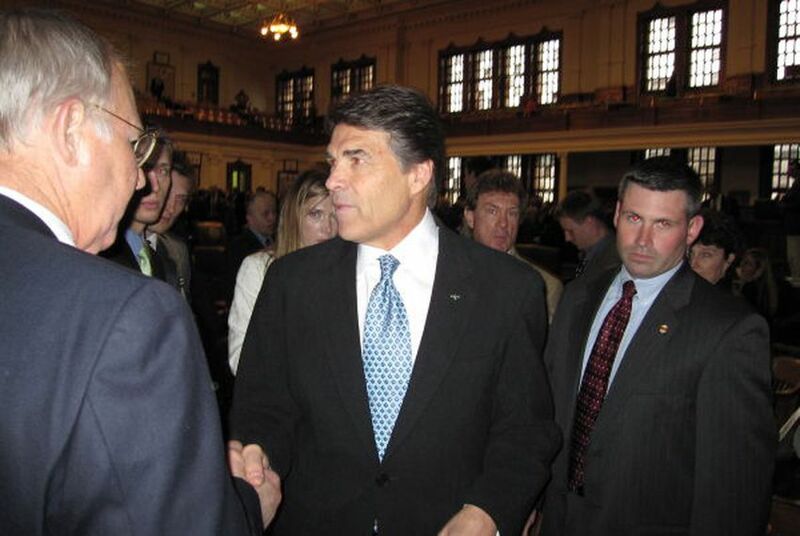 Rick Perry replaced the chairman and two other members of an independent state forensics panel. The Texas Forensic Science Commission's new chairman canceled the high-profile hearing upon his appointment. He says he doesn't know if it will be rescheduled. "I haven't had time to breathe," said Williamson County District Attorney John Bradley, the new chair of the panel. "There wasn't going to be enough time for me to learn about the case before the hearing." The case surrounds Cameron Todd Willingham, a Corsicana man convicted of killing his three young daughters by starting a house fire in 1991. Willingham maintained his innocence until his 2004 execution. He refused offers to plead guilty in exchange for a life sentence. Arson experts who have reviewed the case in recent years concluded the fire was accidental and Willingham was innocent. His story was recently detailed in The New Yorker. The Texas Forensic Science Commission, under outgoing chairman and Austin attorney Sam Bassett, had invited arson expert Craig Beyler to testify at Friday's hearing. The Baltimore-based Beyler was hired by the commission and set to outline his report, which concludes the forensic evidence used to convict Willingham was faulty. Now, it's unclear when — or if — that hearing will go on. "This is like the Saturday Night Massacre," said Barry Scheck, co-founder of The Innocence Project, a nonprofit legal group that investigates wrongful convictions. "Rather than let this important hearing go forward and the report be heard, the Governor fires the independent Chairman and two other members of this Commission. It's like Nixon firing Archibald Cox to avoid turning over the Watergate tapes." The governor's office maintains the new appointments were routine, since the terms of the three members on the panel expired at the beginning of this month. "This is replacing people whose appointments were up," said Perry press secretary Allison Castle. Bradley says he will "do his homework" before rescheduling the hearing, if it is rescheduled. He says his decision to cancel the hearing has nothing to do with the Willingham case. "I don't know if it would have mattered what was going on Friday," Bradley said. "I would have had to drop my schedule. I have a full-time schedule."